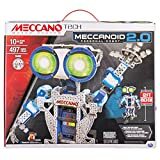 The Meccano Meccanoid is a kids robot that is a lot of fun to take to a child's birthday party. It's worth practising in advance and planning your activities to make sure everything goes smoothly. We've taken Meccanoid to a five year old's birthday party and it was a big hit with the children and the parents too. 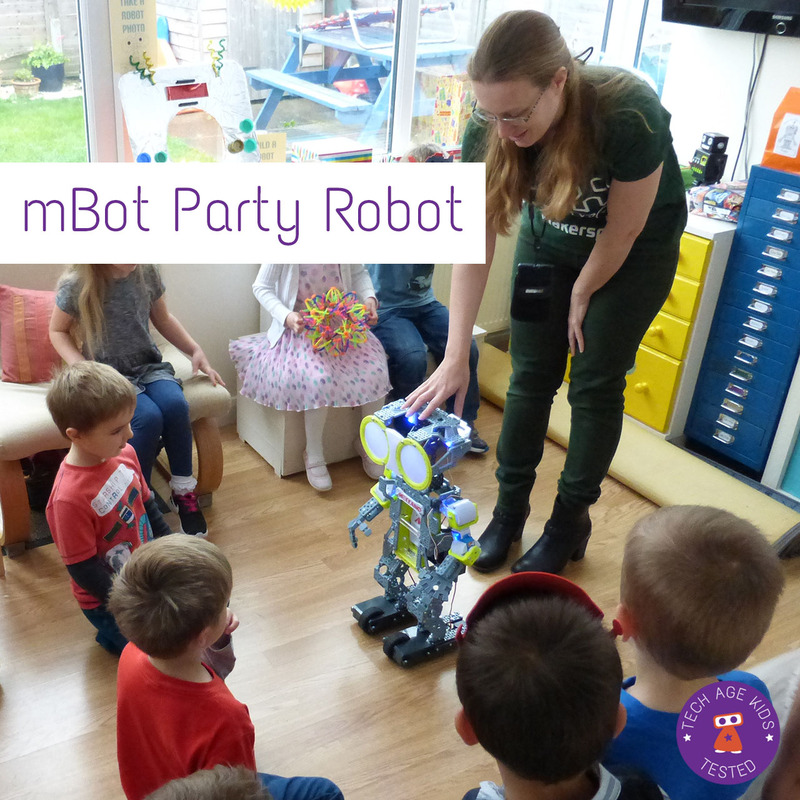 With older children you'll be able to try some different activities but the little ones loved seeing what Meccanoid can do. The Meccanoid G15 KS is kid-sized and will be the most impressive but the smaller G15 model is still pretty cool. 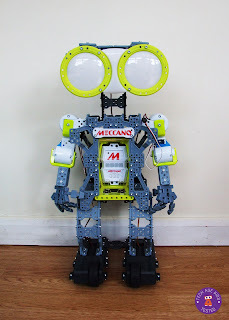 Check out our review of the Meccanoid robot if you need to find out more about what it can do. Meccanoid has a fun set of commands that are perfect for putting on a robot show. You'll need enough space for Meccanoid to do his stuff. We suggest getting the children to sit around the edges of the room to give Meccanoid a stage in the middle. Then put Meccanoid into Motion Control mode by saying 'Motion Control'. Meccanoid also has some fun interactive activities. These are fun to try but not much fun to watch lots of other people doing so we'd suggest you run some other activities in parallel. Though you could let the birthday child have their turn with all the children watching. High Five: Meccanoid offers his hand for a high-five. The child needs to push back on his hand so that the robot can sense the movement. Careful with this one as kids can tip Meccanoid over if they are too rough. Have an adult hold Meccanoid firmly. Shake Hands: Meccanoid offers his hand for a firm handshake. Walk with Me: The robot will explain how to take it for a walk by holding its hand and leading it. This is lots of fun. When Meccanoid is in Learned Intelligent Motion (LIM) mode you can record movement and sound to create a personalized message for the birthday child. You could do this before the party or you could record it at the party with the children shouting out a message to record. An adult or older child can move Meccanoid's arms (and head for the G15KS) around in a funky move while the children shout out Happy Birthday. Or you could do a Hip Hip Hooray. You'll need a tablet or phone with the Meccanoid app for this activity. Make sure you set it up in advance and practice. Ragdoll animation allows children to control the robot by moving an onscreen avatar. The app records the motion for playback, but at a party, just controlling it live is lots of fun. Changing the colour of the LED lights is lots of fun too. This works best if the room isn't too brightly lit. Again, this is best done in small groups while other activities are going on so children don't have to watch lots of other children taking a turn. You can find out more about how this works in our Meccanoid Ragdoll Animation app article. Motion capture uses the camera on a phone to get the robot to copy a person. We would avoid the Motion Capture feature at a party for younger children as it can be tricky to get the Meccanoid to copy them. It also won't work well if there's lots of movement around the person being copied. There's also the time it takes to calibrate between people. This feature is better for parties with older children as patience is needed. Update: Motion Capture has been removed from the app. Meccanoid responds to voice commands. These need to be really clearly spoken without too much other noise. This can be tricky in the noisy environment of a birthday party. We'd recommend an adult or well-practiced older child gives the commands initially. If the party guests are old enough then they can have a go at giving commands once they've seen what Meccanoid can do. 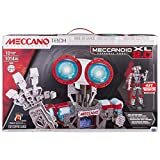 Younger children may find it hard to speak clearly enough for Meccanoid to understand and it's not much fun for them if they get Meccanoid to follow their commands. We did do this at our party but an adult repeated the command immediately if Meccanoid didn't recognise it - some of the children were only 4 though. One little girl loved that Meccanoid did a ballet dance for her! Cute. The Meccanoid G15 runs on C batteries so make sure you put a fresh set in before the party and have some spares just in case. The Meccanoid G15 KS has a rechargeable battery pack so put it on to charge before the party and plug it back in when another activity is going on. This will make sure that kids and robot have a good party. The children were fantastic at our party. They were fascinated by Meccanoid but stuck to the rules. And we kept them busy with other robot activities too. 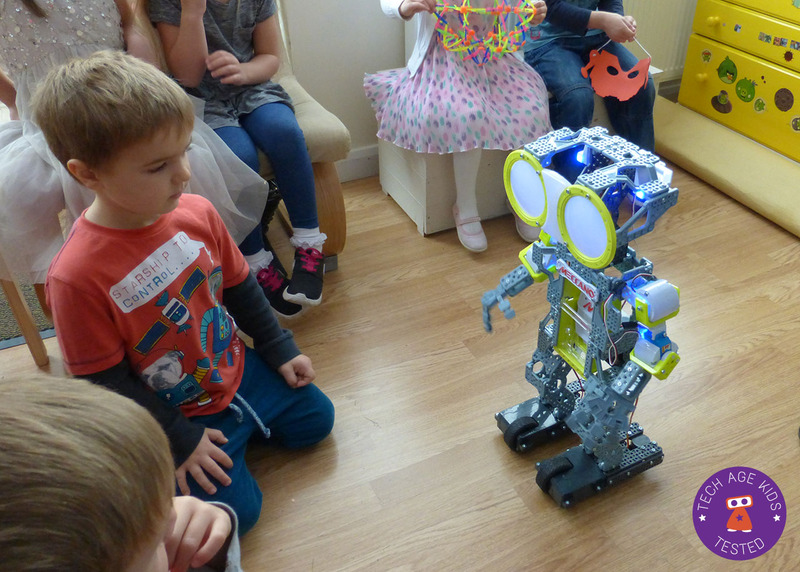 The Meccanoid makes a brilliant birthday party guest for kids who love robots. It won't eat too much cake or get upset when it doesn't win pass the parcel. It will entertain guests for a quick show or keep going with a variety of activities. The new models for 2016 are the smaller Meccanoid 2.0 and the larger Meccanoid 2.0 XL.